The first customers approved under the University of Alaska Flight Test Site National Certificate of Authorization to fly at an Oregon Test Range are the University of Alaska, Aeromapper UAV. Also the ArrowData’s Aerialtronics UAV. Warm Springs, OR – Tribally owned Eagle Tech Systems announced today that the first launch of unmanned aerial vehicles has occurred at the Metolius Bench occupational site. The Warm Springs Unmanned Aerial Systems Test Range is part of the Pan-Pacific UAS Test Range Complex, led by the University of Alaska, one of the six nationally recognized FAA-designated UAS Test Sites. It makes sense for the University of Alaska to be the first client for the Warm Springs UAS Test Range. The Aeromapper drone is ideal for surveying large sized areas for forestry, wildlife monitoring, geophysical surveys, and topography, among other uses. The maximum takeoff weight is about 10 pounds and the wing span is 6 ½ feet long. It has a Sony 24 mp camera and a survey grade wide 15 mm lens with adaptor. It also makes sense for ArrowData, too, because it is an enterprise which is owned by the Ukpeagvik Inupiat Corporation, an Alaska Native Corporation that is headquartered in Anchorage, Alaska. The Aerialtronics drone is used for precision agriculture reports. The model is called the Altura Zenith, it is actually an octo-copter. The maximum takeoff weight is 14 pounds. It has the MicaSense multispectral camera for agriculture along with a cinema grade video camera and a high resolution still camera. Friday’s Media Day provided everyone with an up close look at the drones. Those in attendance included tribal leaders, and the organizations who provided financial support for the Test Range, Business Oregon and SOAR Oregon. “It’s going to be exciting to see the flights,” said Evaline Patt, vice chairwoman of the Warm Springs Tribal Council. Patt said she’s looking forward to the potential for drones to help with forest fire management and local farming operations. “We have four active clients at our range and we’re in conversation with an additional dozen potential clients including one with an international presence”, said Roy Sampsel, Chairman, Ventures Board of Directors. “We are excited about the opportunity to be on the ground floor with this UAV technology,” said former Governor Ted Kulongoski, member of the Warm Springs Ventures Board of Directors. “Oregon has been given an opportunity to play a leadership role in the creation of an emerging industry. We should use all the tools at our disposal to advance this technology. Our three Oregon test ranges are uniquely situated to facilitate the continued growth of Unmanned Aerial Systems for the foreseeable future.” said Senator Betsy Johnson. 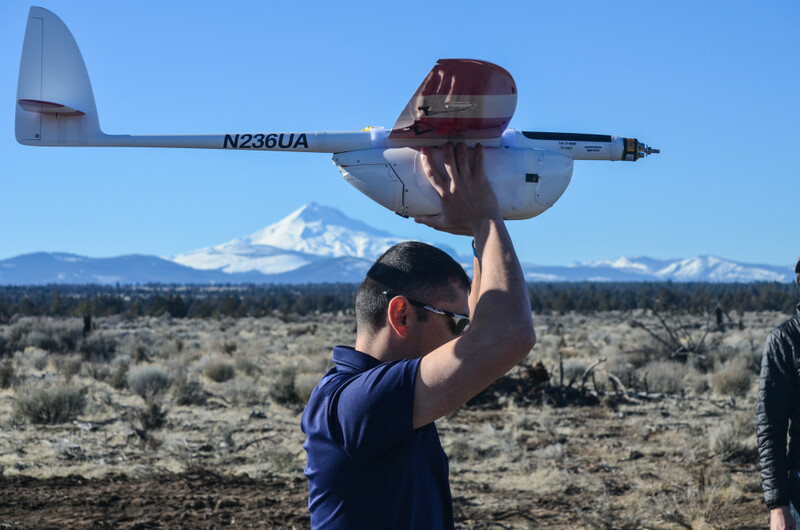 The first customers approved under the University of Alaska Flight Test Site National Certificate of Authorization to fly at an Oregon Test Range are the University of Alaska, Aeromapper unmanned aerial vehicle. Warm Springs, OR – Tribally owned Eagle Tech Systems announced today that the first launch of unmanned aerial vehicles will take place on Friday, February 19, 2016 at 1:30 p.m. at the Metolius Bench Operational site. Light refreshments and a cake will be served to celebrate the inaugural flight. Cell telephones and cameras are allowed for use at the event. We are in a unique position in the growing unmanned aerial systems industry. We are one of 12 Test Ranges approved by the FAA in the United States and we are one of three in Oregon, along with Tillamook and Pendleton. Our partner VDOS Global is authorized by the University of Alaska to process flight authorization within a two-week timeline, in comparison to six to nine months for approval by the FAA. Our mission is to provide services for our clients to Fly faster, Fly safer, and Fly smarter. 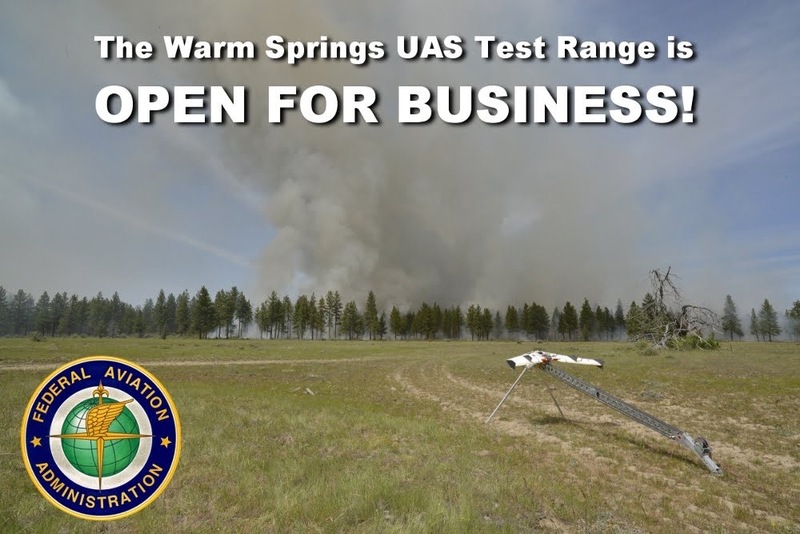 The Warm Springs UAS Test Range offers a turn-key testing environment for flight authorization, flight testing, evaluation, and a training center that will be located at the Kah-Nee-Ta Lodge and resort. As a sovereign nation, we offer ease of services at our test ranges. For example, we have the ability to have controlled burns without having to get certifications or approvals with any outside entity. We are focused on becoming a Center of Excellence for wildland fire management. Also, there is a de-energized power transmission line that will also be available for tests for that particular industry. The third market is natural resource management. The weather forecast is favorable for the flight testing by the University of Alaska’s “Aeromapper” UAV. Though commonly known as drones, the term unmanned aerial vehicle (UAV) is preferred by COCC’s Unmanned Aerial Systems Degree Program. With graduates possibly completing the program as early as Spring term of 2015, the program prepares students to become professionals in the world of remotely piloted aircraft. While many programs are engineering and design based, COCC’s UAS program focuses on operating the vehicles. Students will also learn UAS mission planning and execution, troubleshooting, maintenance and equipment testing. The two-year program is not meant to train operators of recreational drones you may see flying below 400 feet and in sight of the user. This intensive two-year program was borne from COCC’s Aviation program and prepares graduates for the broadest spectrum of employment. Though Federal Aviation Administration (FAA) regulations are still pending, COCC is teaching the UAS program as though UAS operators are required to be a certified pilot. This fundamental training allows students exposure to the aviation environment, communication, equipment and commercial airspace — all focusing on safety in the skies. Central Oregon’s diversity of terrain and elevation is well-suited for training purposes. Kevin Sivertson, Insitu veteran and part-time instructor, is breaking new ground for COCC by translating his experience as a UAS operator to a classroom environment. Sivertson, who holds a master’s in education, credits his military knowledge for being recruited by Insitu, Inc., where he trained and operated UAS in support of international government contracts. The program has already proven that through time, effort and collaboration, it can make connections with the community and partnership within the industry, allowing for a stronger program which ultimately leads to students’ increased preparedness for employment. “With how quickly technology changes, there is no way you can work in a vacuum and remain on the cutting edge,” says Baldessari. Contact Karl Baldessari, aviation program coordinator at [email protected] or go to www.cocc.edu/aviation/uav-degree-program to learn more about this exciting program.